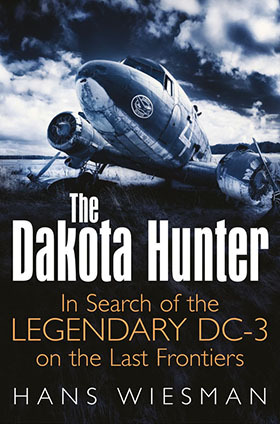 In this DAKOTA HUNTER Blog, you can read about the Japanese Monster Aircraft Carrier Submarines, built initially for raiding the US Coasts. The Japanese Navy under the visionary Admiral Yamamoto (architect of the Pearl Harbor Assault in December 1941) developed a plan for a fleet of huge Subs that each carried 3 Hi-Tech attack/ bombers inside a tubular hangar, that was mounted on a double tubular fuselage. The novel design of the I-400 series (built in December 1944) gave stability with 2 hulls welded next to each other and made up for the largest Submarine ever built until the 1960’s nuclear subs came out. Overall length was almost 400 whopping feet (122 m) and an unrivaled armament of a huge 140 mm canon (never seen before on a sub) plus 4 power packs with 25 mm AA guns and special torpedo’s inside. The Monster Subs were weighing 5,700 tons, carrying a crew of 200 and possessing a range of over 50,000 miles, with weapons and 3 aircraft designed to become the first Submarine fit for an offensive strike on the US mainland targets on West & East Coast! The real surprise novel was on top of the double hull, a spectacular hangar with inside 3 Aichi-M6 Seiran aircraft that could each carry an 1850 lbs. bomb over 1,000 miles. From a long launch ramp on the front deck of the sub, a steam catapult was used to shoot the aircraft airborne and after landing on their floats, a foldable crane was used to hoist the aircraft back on board. Five of the Monster Subs were built, but only three were launched. One made a trip around the Horn of Africa to Germany and another one was converted as a sub-tanker. The I-400 series submarine had a number of advanced features like radar and the by Germans invented snorkel for extended underwater cruising on the Diesel engines, allowing the batteries to be charged. 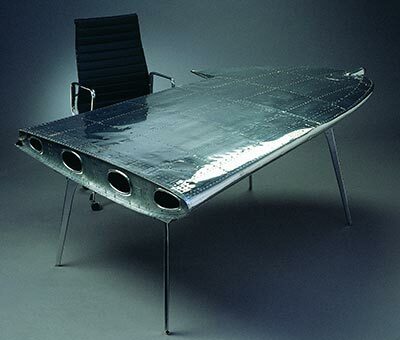 But most amazingly also stealth technology: energy absorbing skin with a rubberized coating that would help the submarine remain undetected by sonar equipment of the Allied Sub hunters. Photo above shows the huge 140 mm cannon on the aft deck plus the racks of 25mm AA-guns around the conning towers of the subs. It was an armament that was capable of confronting attacking aircraft as PBY Catalinas with their depth charges, bombs, and .50 Machine guns. If a scramble for a dive was too late, the shootout with overhead attacking aircraft was the only option left and the new AA guns were considered a powerful weapon to deter the enemy aircraft. 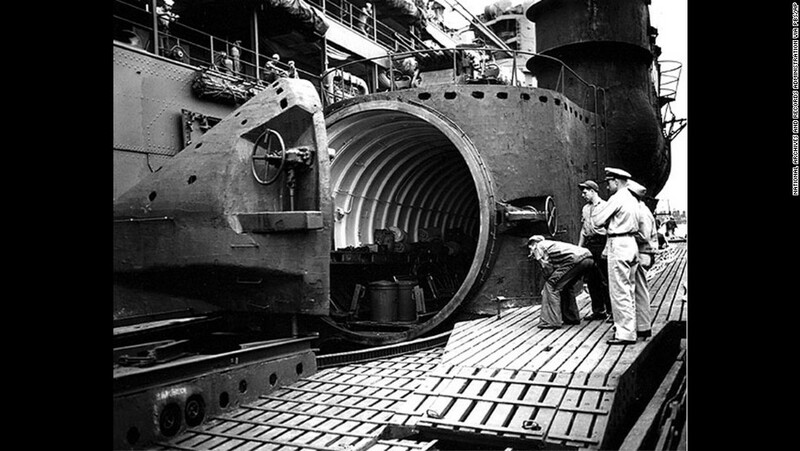 Moreover, there were 8 x 5,5-inch torpedo tubes in the double hull under the bridge and hangar. This was a serious warship for long distances. The original order of 18 such I-400 series Subs was slashed to 9 after Admiral Yamamoto got killed by a US Interception force on the way to the Solomon Islands on April 18, 1943. The Allies broke the secret Japanese Navy codes and shot down his plane in an ambush. 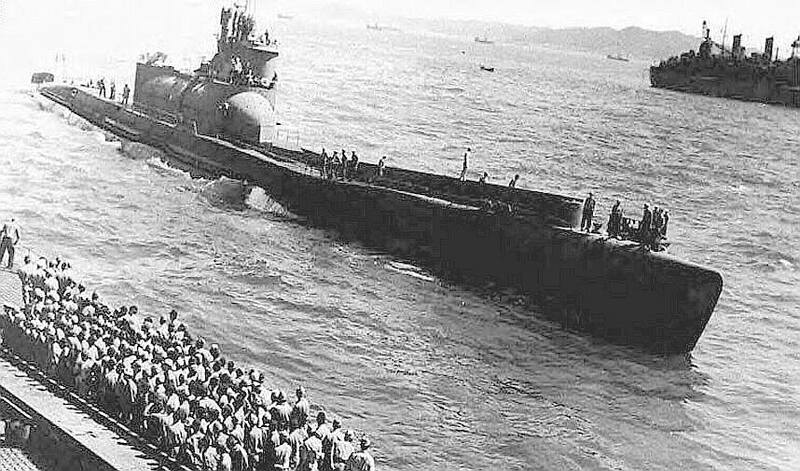 With the inspirational mind and power of the Master gone, the Monster Submarine program soon started to lag behind the fast developments in the Pacific War and a tragic career of missed opportunities followed for what was potentially the most lethal weapon the Japs had to threaten the dominant US Navy in the Pacific. In December 1944 the first of the series, I-400 was commissioned, soon followed by I-401. Their original plan to terrorize the US West Coast cities failed as the impact of only 2 subs with 6 planes would not be sufficient to create large-scale havoc and becoming a real menace for the USA. This plan was not fully abandoned, instead, the Japs developed a similar plan but with the use of Biological weapons to attack large cities and spread bacterial diseases, the killer bug they had developed in China since the late 1930s. In this blog, you can read how the USA escaped from this ordeal. Photo above; The Imperial Japanese Navy had a level of technology which was higher than most opponents had ever estimated. Not only they designed the largest and best-armed submarine ever built with the I-400 series, the sub could also carry 3 aircraft in a special onboard tubular hangar with a most ingenious storage system for the aircraft. 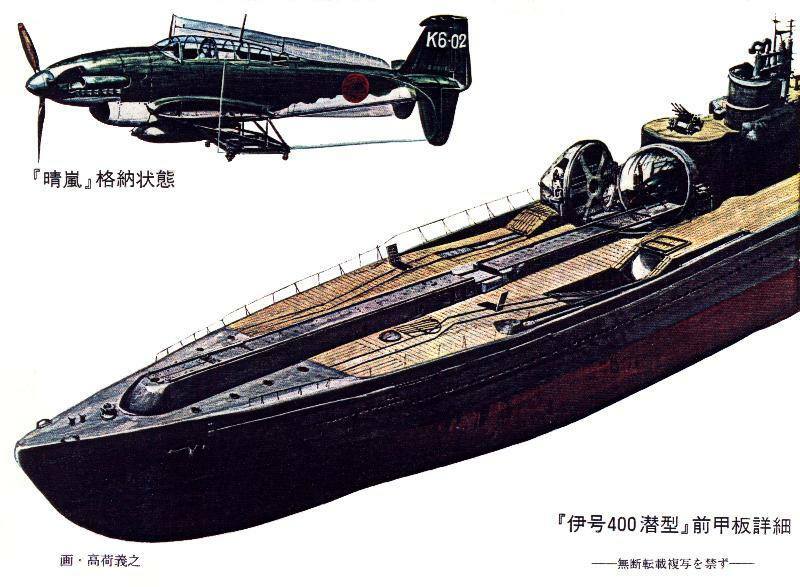 The Aichi-M6 Seiran was built from scratch to fit inside this cavernous space that was a water-tight compartment fit to dive with the sub to 330 feet depth (100 m) without any damage to aircraft or systems. The aircraft, after completing its mission, would land next to the Sub and with an onboard crane be picked up and loaded back onto the sub. The dismantling of the floats and the folding of wings and tail were to follow. Photo above: The aircraft was of a very sleek design, with a top speed of 555 km/h and a range of over 1.600 km, it could carry an 850 kg load of bombs or a torpedo. The plan to make a biological/ biochemical attack with 6 of such planes on the US West Coast cities was abandoned under the pressure of another Japanese Admiral, who had the correct sentiment that if Japan would execute this plan, the wrath from all over the World would come over them. Ironically, at that very moment, in total secrecy, the USA was about to test its first atomic bomb explosion and only 6 months later the first nuclear attack in history would hit Nippon at the heart on Aug. 6th, 1945 with the assault on Hiroshima. Read here how the Moster Subs fared to find their final fate. 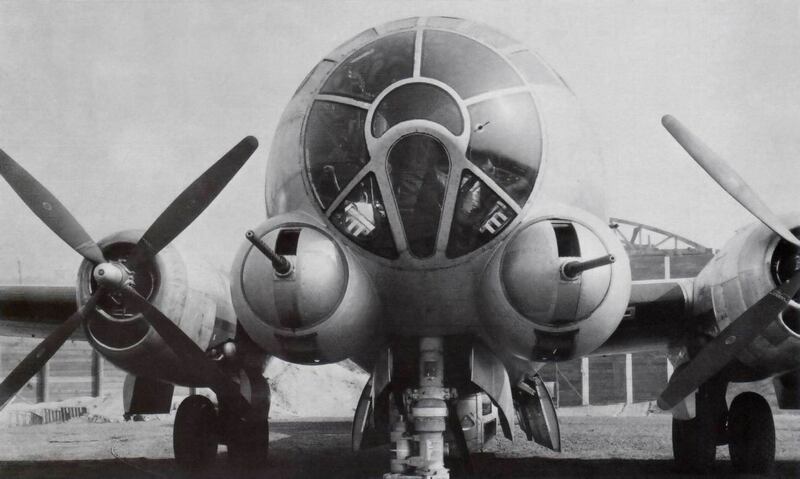 Picture above shows the Attack / Bomber aircraft Aichi-M6 Seiran was a totally new design of an aircraft structure that could fold within the limitations of its own propeller diameter! Folding wings were nothing new on aircraft carrier planes, but the way Aichi designed it, set a new standard. Look at the picture and you’ll see the wings not fold like a Bearcat or F4U Corsair, but these wings first twist 90 degrees over their full wingspan, then fold backward, tightly along the fuselage. Finally, the total tail section folds to minimize the “cross section diameter”. The large floats are taken off and stored in special bunkers on deck. 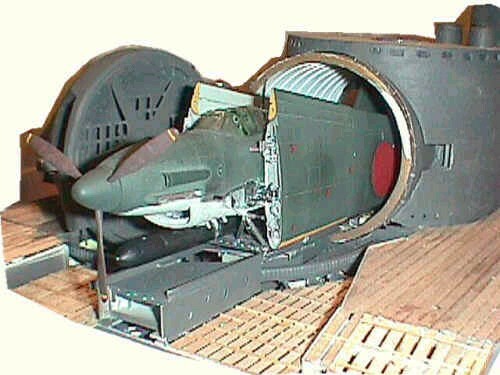 What remains to be pushed back into the tubular hangar is the “Rubik’s Cube” version of the aircraft fitting in a hangar of 11 feet diameter (the Prop arc). Once inside, the huge watertight front door was locked with a clamp and the ship could sail to any place over the globe and return without a single stop for refueling. Again a new plan emerged: Attacking with the 2 giant subs the Panama Canal and destroy the Gatun Locks with a Kamikaze attack of the 6 Aichi Bombers. The destruction of a water lock door could effectively block the ship’s passage for months. But again, the plan had to be abandoned due to the strong progress of the US Navy towards the Japanese homeland in early 1945. It was all hands on deck for helping the Japanese Navy in its agony. In their final attempt to let the subs do what they were built for, the I-400 and I-401 were sent for a desperate assault hoping to turn the tide for the Imperial Japanese Forces. The much feared US Aircraft carriers were all gathered near the small Ulithi Atoll (East of Philippines) in preparation for the last big naval attack. Their presence lured the Jap Monster subs. But again, the events ran faster than the boats could sail. On their way to the Atoll, the Atomic bombs fell on 6 and 9 August. Hence, on 15 Aug.1945, both subs received the news of the Japanese surrender: they were ordered to give themselves over to the US Navy. 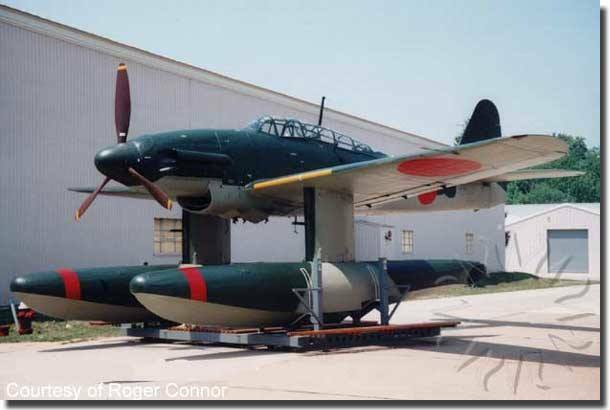 Their bombers had been pushed overboard to avoid capture, but in Japan, the US Army later found one surviving example and did extensive testing. 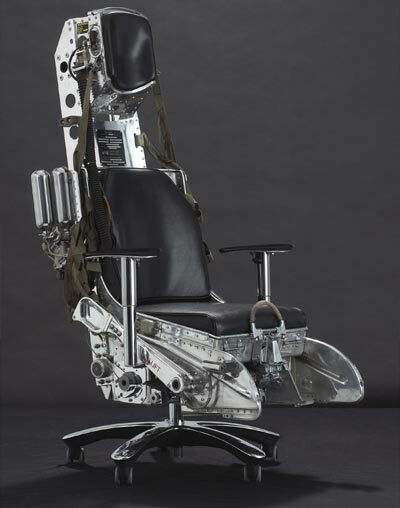 That aircraft is now on display at the Smithsonian Institution in its Aviation Museum near Dulles International Airport, Washington DC. Photo above depicts the surrender of I-400 and I-401 to the US Navy on 28 Aug 1945. 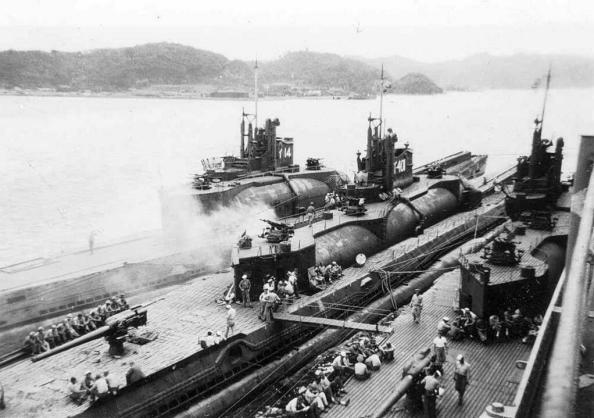 Both submarines next to each other, with all the POW sailors sitting on deck under the massive attention of the US ship crews. That surrender was too much for the Commander of the fleet onboard, he committed suicide but the rest of the crew gave up. 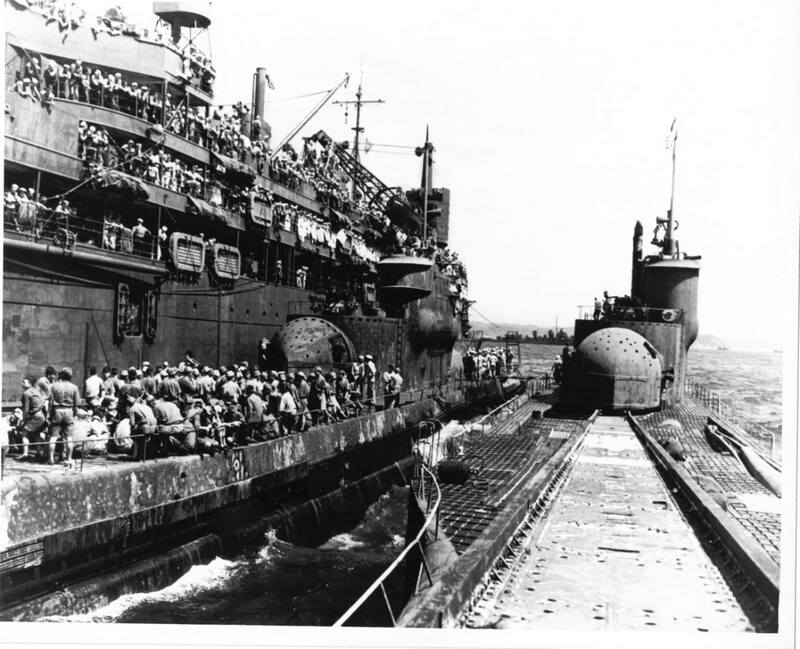 The subs were entered by US Navy and sailed to Tokyo, as you can see on this fascinating photo right after their surrender. Photo above shows the cavernous hangar of the I-400 Sub that could store the 3 aircraft inside. US sailors had never seen such aircraft carrier submarine of this size and such advanced features. Note also the shark-skin surface of the Monster sub, a High-Tech rubberized coating against sonar detection. After their arrival in Tokyo, the US Navy understood the importance of this “catch” and obviously tried to keep them away from other nation’s spy eyes. The Monster Subs were soon sailed to Oahu/ Hawaii and were docked for an in-depth inspection of their very advanced technology. The Russians claimed the subs as war booty, but evidently, the US Navy was not very willing to hand over those much-wanted ships in the light of the looming Cold War in 1946. In the year 2013, the buckled I-400 Monster Sub was discovered, resting on the ocean floor at 2,300 feet depth in the Pacific Ocean off the southwest coast of Oahu. (see picture below). The once ultra advanced submarine was discovered by Hawaii Undersea Research Laboratory explorer Terry Kerby and colleagues from the National Oceanic and Atmospheric Administration and the University of Hawaii at Manoa’s School of Ocean and Earth Science and Technology. Photo above gives some scale: the “Standard” size WW II Submarine in the front and the 3 Japanese Monster Subs of the I-400 series in the backdrop. Read and see more about the torpedoing and discovery of the I-400. There is a film with authentic footage of both subs, this is 52 mins video but better than any Hollywood production! Please view it here and enjoy: https://www.youtube.com/watch?v=mBx2Bu-jnOs. For shorter information about the discovery of the Monster sub and camera footage, you can also click this link here Daily Mail news discovered I-400, 2013. Commercial section about my 2 books. This is a photo album with over 300 photos, most in color and many never published before. You will be surprised to see this unique hardcover book with photos of the Catalina from both the wartime 1939-1945 and its post-war services in the civil and military roles 1945-1999. Plus my own TransAmerican Catalina Odyssey trips in 1993-1994 that are well covered with most romantic photos of the exotic lagoons, beaches, and lakes where we landed with the Catalina. The book ends with a wealth of Catalina photos of those that have survived into the New Age, as static museum displays or flying aircraft! Photographers, Operators, and major Aviation Museums from the USA, Canada, UK, Aus, NZ, NL, SA, Sweden have contributed with their best photos, including some wartime photos granted by the Smithsonian Institution, Washington, DC. for this book. 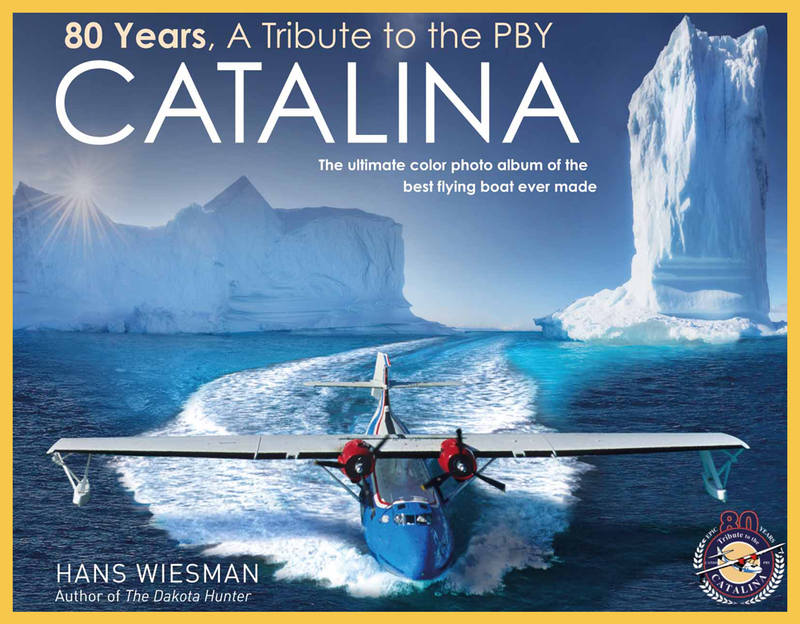 With a contributing story from David Legg, editor of the Catalina News magazine, this unique album is a MUST-HAVE for all aficionados of (vintage) aircraft and those with passionate feelings for the Golden Days of the Flying Boats. Fly away with me to another world, there exists no other comparable photo album in the market with 0ver 300 (mostly) unique large size photos of the Catalina! PS. If you seriously think you have interesting photos of a Canso/ PBY Catalina, from your family album or a friend’s collection, old or new, please submit to me! If the photo will be published in my book, your name will be in the caption and, evidently, you will receive a free autographed version of my new book. The awesome B-54 UltraFortress, Boeing’s best Piston Prop Bomber that failed to ever fly!